NYC, 04/24/2019, 6:00PM. 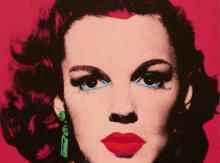 Warhol Women: Portraits from the 60s through the 80s. The selection of paintings, covering the full scope of Warhol’s career, invites the viewer to ponder the artist’s complex and often contradictory relationship to myths and ideals of femininity, beauty, and power. Whether intimate or monumental in scale, each canvas embodies the ambiguities that animate Warhol’s oeuvre. Made using his signature silkscreen process, they seem at first glance to submit to impersonal iteration—the machine-like detachment of the Factory production line. Yet, upon sustained viewing, they convey something indelible about their sitters: an aura of intimacy that by turns intrigues and unsettles. Forever undecidable, these portraits offer up both the glittering surface and the raw humanity of Warhol’s art, which pulses with the evidence of his halftone silkscreen process and, in works of his later years, fluid strokes of synthetic paint. Through paintings riotous and defiant, vulnerable and demure, Warhol Women sheds fresh light on both the artist’s oeuvre and our present moment, wherein questions of female empowerment and the construction of identity through images are as urgent as ever.